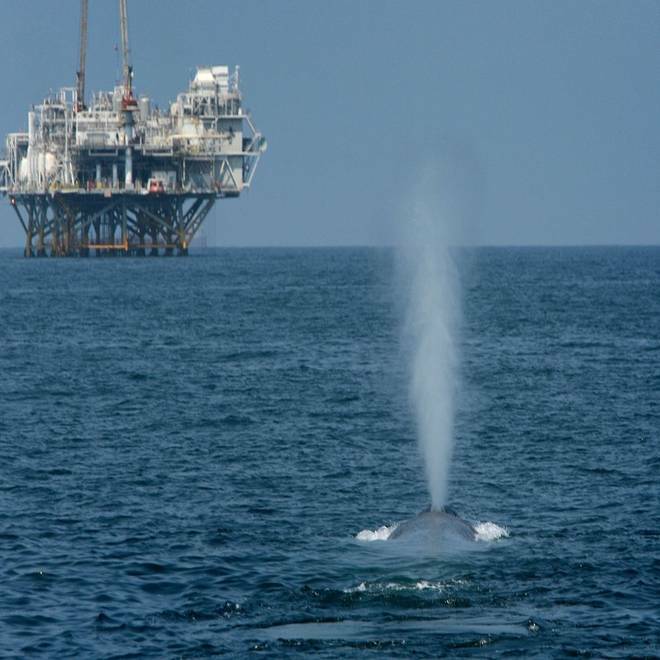 A rare and endangered blue whale, one of at least four feeding 11 miles off Long Beach Harbor in the Catalina Channel, spouts near offshore oil rigs after a long dive in 2008. SAN DIEGO -- The California Coastal Commission on Friday rejected a Navy explosives and sonar training program off the Southern California coast that critics said could harm endangered blue whales and other sea life. Commissioners meeting in San Diego ruled unanimously that the Navy lacked enough information to back up its argument that the threat to marine mammals would be negligible. The program had been scheduled to begin in January. Commission staffers had recommended that the panel require additional wildlife protections before endorsing it. The panel and the Navy could now seek mediation to iron out their differences — or the Navy could simply choose to proceed with the training, as it did in 2007 and 2009. That probably would prompt the commission to sue in an effort to block the program, as it has in the past. Before the vote Alex Stone, who directs the training program, told commissioners that the Navy opposed additional conditions that could make the training less realistic and reduce its scope. Stone also said he believed the program has sufficient protections for sea life — an argument disputed by environmentalists who packed the meeting. The Navy has estimated that the proposed training program would kill 130 marine mammals and cause hearing loss in 1,600 over five years. "We think these are underestimates," Michael Jasny with the Natural Resources Defense Council told the commissioners. The Navy's testing area encompasses 120,000 nautical square miles of the Pacific off the Southern California coast and includes a corridor between the state and Hawaii, among other areas. The commission's staff had recommended that approval be contingent on a list of conditions. They included requiring that the Navy create safety zones that would guarantee no high-intensity sonar activity near marine sanctuaries and protected areas and in spots that experience a high concentration of blue, fin and gray whales seasonally. The staff also said a kilometer from shore should also be off-limits to protect bottlenose dolphins. The commission set out similar conditions to the Navy in 2007 and 2009, but the Navy refused to accept them both times. The commission sued the Navy over the matter, leading to a preliminary injunction in 2008, though then-President George W. Bush gave an exemption for the training. The U.S. Supreme Court later overturned the lower court's decision. Jasny's organization and three dozen others say they want the Navy to avoid important habitat for vulnerable species, including endangered blue and fin whales, beaked whales, and migrating gray whales. They also want the Navy to not use sonar training and underwater detonations at night, when marine mammals are extremely hard to detect. And they want the Navy to be required to use its own acoustic monitoring network to help detect marine mammals. They also say that from May through October ships should slow to 10 knots in areas with baleen whales, to avoid hitting them. Scientists say there is still much to be learned about how much sonar activity affects marine animals. Studies have shown some species such as beaked whales may be adversely affected by some forms. A rare look at a spectacular show of nature, as gray whales make a splash off the coast of Southern California. They've made an impressive comeback and are giving the economy of that region a real boost. NBC's Diana Alvear reports.